:When a thought comes to mind, the words flow.Inspired by faith, Miracles of Mercy &amp; Grace is a calming and uplifting remedy for the soul. 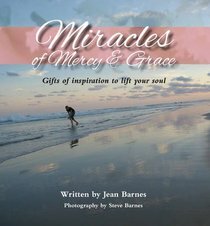 As a Christian of forty years, author Jean Barnes is truly blessed to have been given a strong faith in the Word of God, the Bible. Jean's carefully crafted words focus on the beauty of nature and sing praise of His glorious grace. About "Miracles of Mercy & Grace: Gifts of Inspiration to Lift Your Soul"
Barnes is a freelance illustrator.